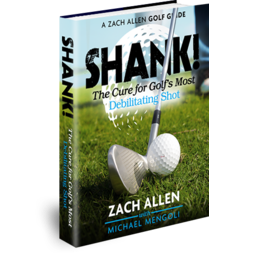 Zach revisits the dreaded shanks — and introduces the “water bottle drill” to cure them. Thanks Zach. I think this will really help me as have your other instructions. With your help I cut my handicap in half from a 15. A great tip. When I was young, I used to take everything out of my right pants pocket so I could get close to my right thigh…but later I got away from it — I think because my divots started to point way right of the target. I have a tendency to overdo a good thing. This tip provides audio and tactile feedback and still gives the right arm enough clearance to avoid getting trapped behind the thigh. 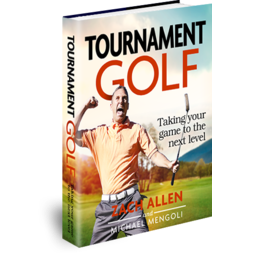 What is your video where you talk about what the right arm does on the downswing – you said ” it straightens at the elbow and retains the angle with the wrist ” I believe – I cannot find it again – thank you – your videos are very helpful. I’m a 15 handicap trying to get better. The Secret of the Right arm. Why compare a driver (Baddley) with a mid iron? It does not look like Stenson swings this way with a driver. Am I wrong? I found it damn near impossible to hit the bottle. Maybe because of the cargo shorts? However in trying to get as close as I could, paying attention to the distance between my hands and the right thigh, the ball flew off straight and consistent. I also was using the Golf Swing Shirt at times to keep me connected. I’ll keep up with the bottle drill (although I may have to stuff a gallon milk jug stuffed in there). Zach Allen drills are great. Just found this drill online went to the range and started hitting the irons and woods straight as an arrow. This drill also helped with my short game. Getting my elbow in deep at impact and the shaft and forearm are the main things that helped me. Now I just need to amp up the swing speed and this is the best of both worlds of distance and accuracy. THANKS!